Polyneuropathy has an estimated prevalence of 2%–3% in the general population and a prevalence as high as 8% in people over the age of 55 years.1 Roughly one-third of polyneuropathies will have a genetic cause, one-third an acquired etiology, and one-third will be idiopathic, despite appropriate diagnostic evaluation.2 There are over 100 known acquired and inherited disorders that may cause polyneuropathy, a fact that presents challenges and can contribute to uncertainty about the scope, direction, and level of aggressiveness of any evaluation.3 This sometimes leads to a one-size-fits-all diagnostic strategy, a strategy that is unfocused, inefficient, and costly, and sometimes places the patient at unnecessary risk of a procedure-related complication (e.g., nerve biopsy). In this article, we present a simple and easy-to-remember algorithm for diagnosing polyneuropathy, based on first answering 4 clinical questions: what, where, when, and what setting (figure 1).3 The 4-step clinical characterization should almost always be followed by electrodiagnostic (EDX) characterization with appropriate nerve conduction and needle EMG. The clinical and EDX characterization can then be combined, as necessary, with a consultation of appropriate tables and lists of differentials or the figure we provide in this article, allowing for the generation of a focused differential diagnosis and appropriate and efficient evaluation. Only the most common etiologies are found in this figure. Red font indicates predominantly demyelinating polyneuropathies and yellow font indicates predominantly axonal polyneuropathies. CIDP = chronic inflammatory demyelinating polyradiculoneuropathy; CMT = Charcot-Marie-Tooth; cryo = cryoglobulinemia; GBS = Guillain-Barré syndrome; hDMN = hereditary distal motor neuropathy (uncommon); HNPP = hereditary neuropathy with liability to pressure palsies; HSN = hereditary sensory neuropathy (uncommon); IgM M protein = also known as distal acquired demyelinating symmetric (DADS) neuropathy or frequently anti-MAG neuropathy; MMN = multifocal motor neuropathy; M protein = monoclonal protein; N-NSS = negative neuropathic sensory symptoms only; P-NSS = positive neuropathic sensory symptoms; SSN = subacute sensory neuronopathy (usually associated with malignancy, especially small-cell lung cancer); URTI = upper respiratory tract infection. “Where?” refers to the distribution of nerve involvement in terms of 1) the global distribution throughout the body and 2) the distribution of involvement along the nerves. It is important to determine whether a neuropathic process is length-dependent (e.g., distal) or not. Length-dependent polyneuropathies are common and often manifest symmetrically. In contrast, patients with non-length-dependent polyneuropathies might complain of proximal sensory or motor complaints (i.e., early symptoms in the hands). Distal, symmetric polyneuropathies usually have metabolic/toxic, idiopathic, or inherited etiologies, whereas asymmetric neuropathies are often immune-mediated or infectious.1,3,5,–,7 There are, of course, exceptions, such as the clinical presentation of recurrent, painless, transient mononeuropathies in hereditary neuropathy with liability to pressure palsy. Polyneuropathy associated with immunoglobulin M (IgM) monoclonal protein or anti-MAG autoantibodies is another interesting exception that presents with slowly progressive, distal and symmetric sensory polyneuropathy. Some examples of non-length-dependent, asymmetric (acquired) polyneuropathies are polyradiculopathies (e.g., Lyme neuroborreliosis), polyradiculoneuropathies (e.g., Guillain-Barré syndrome [GBS], chronic inflammatory demyelinating polyradiculoneuropathy [CIDP]), dorsal root ganglionopathies (e.g., paraneoplastic subacute sensory neuronopathy, Sjögren-associated sensory ganglionopathy), plexopathies (often immune-mediated), and multiple mononeuropathies (often caused by vasculitis). “When?” refers to the temporal evolution, which can be thought of as including the onset and the progression. We prefer to describe symptom onset based on whether or not the neuropathic symptoms had a convincing date of onset. 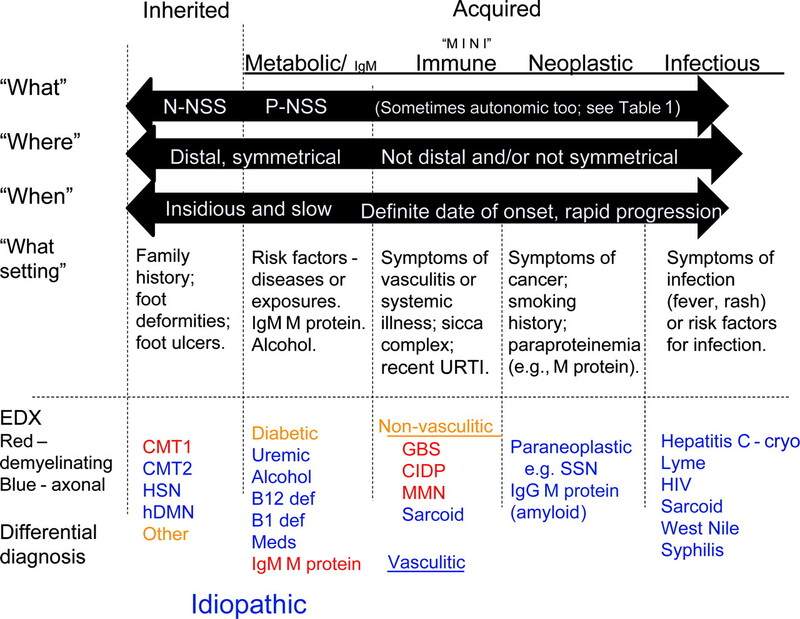 Most immune-mediated or infectious (e.g., Lyme neuroborreliosis) neuropathies have a definite date of onset. A less-exact date of onset suggests a toxic/metabolic, inherited, or idiopathic etiology. Symptom onset and tempo often correlate because they both represent the pace of disease progression. For example, patients with GBS present with a definite date of onset followed by rapid progression of impairment and disability. Conversely, the symptom onset of an inherited polyneuropathy is usually insidious and followed by very gradual progression. “What setting?” refers to the unique clinical circumstance of the patient. This characterization is done by considering the patient’s past medical history, current and past medications, social history, family history, and the review of systems. Knowledge of the risk factors of polyneuropathy and knowledge of symptoms and signs of the risk factors for neuropathy are necessary to take advantage of this information. When constructing the patient’s clinical setting, the clinician must remember to consider first the common causes of polyneuropathy (e.g., diabetes, alcohol, inherited) and search aggressively for any clinical clues that might suggest these etiologies. This is perhaps most important when evaluating a patient for an inherited polyneuropathy, particularly given how common they are. At a minimum, the clinician should ask specifically about each first-degree relative, for example, “Did either parent or any sibling have foot problems similar to yours?” Patients should also be asked at follow-up visits as patients often learn important family medical information only after their own diagnosis. Family members should be examined whenever possible. By doing this, clues are often uncovered that would have otherwise never been. Obtaining a precise history of alcohol intake is also very important and, in our experience, often performed perfunctorily by others. It is often illuminating to probe into an alcohol consumption history in a thorough, nonjudgmental, and nonthreatening way.8 Past medical and medication history are also important considerations for elaborating the patient’s unique clinical setting. Diabetes, renal disease, malnutrition, HIV, and paraproteinemia are some of the disorders that are risk factors. Toxic polyneuropathy caused by medication is common in the setting of certain chemotherapeutic or anti-HIV treatment exposures (table 2).1,9 Age is another important consideration: young patients are much more likely to have a polyneuropathy on a genetic basis, elderly patients are much more likely to have idiopathic polyneuropathy, and middle-age patients are more likely to have acquired polyneuropathy. The physician must also consider whether the rest of the characterization (i.e., “what?,” “where?,” “when?” characterization) fits with the clinical setting and also must consider other possible etiologies before implicating an etiology. For example, the comorbidity of diabetes in a patient with polyneuropathy does not necessarily prove diabetes is causative.10 The examination must also corroborate with the overall characterization. For example, we recently evaluated a 38-year-old man with diabetes complaining of sensory symptoms in the hands and feet whose examination demonstrated not only sensory loss but also pathologically brisk reflexes, prompting a workup that led to the diagnosis of large disk herniation causing a cervical myelopathy. A detailed review of the important causes of polyneuropathy is beyond the scope of this review. Please consult other articles and chapters for information and for additional references about the individual causes of neuropathy. See table 1 for a list of common etiologies and proposed laboratory testing for various patterns of polyneuropathy. See table 2 for a list of some medications that can cause polyneuropathy. The authors of the practice parameters note that most studies suggest that the following laboratory tests are indicated for DSP: complete blood count, erythrocyte sedimentation rate, comprehensive metabolic panel, thyroid function tests, serum B12, and serum protein immunofixation electrophoresis. The evidence is currently most compelling for blood glucose, serum B12, and serum protein immunofixation electrophoresis, of which the test with the highest yield is blood glucose, which comes as no surprise knowing that diabetic polyneuropathy is the most common cause of DSP. Monoclonal gammopathy of undetermined significance (MGUS) is common in the adult population, occurring, for example, in 3% of people over age 50. Monoclonal gammopathies are more common in patients with DSP than in the normal population.18 Thus, for patients with DSP and a serum monoclonal protein, the clinician must determine whether or not the polyneuropathy is coincidental or secondary to the paraproteinemia. Polyneuropathies associated with paraproteinemias include distal acquired demyelinating symmetric (DADS-M) neuropathy (also known as an ataxic, sensory-predominant CIDP variant), neuropathy associated with primary systemic amyloidosis, neuropathy of polyneuropathy, organomegaly, endocrinopathy, M protein, and skin changes (POEMS) syndrome, and neuropathy associated with Waldenström macroglobulinemia. The history and EDX testing are particularly helpful in sorting out whether the paraprotein in a patient with polyneuropathy is coincidental or causal, especially if the physician remembers the following: 1) accompanying systemic symptoms (e.g., fatigue, weight loss) raise concern for primary systemic amyloidosis, POEMS, or malignancy; 2) autonomic symptoms and signs (e.g., orthostatic hypotension) are common in primary systemic amyloidosis; 3) EDX features of primary demyelination are commonly seen in neuropathies of DADS-M and POEMS; 4) the neuropathy is usually axonal when associated with Waldenström macroglobulinemia and primary systemic amyloidosis; and 5) sensory ataxia is a prominent feature of IgM-related polyneuropathies, such as those associated with DADS-M and Waldenström macroglobulinemia. Patients with DADS-M neuropathy also often have serum antibodies to myelin-associated glycoprotein (MAG).19 Conversely, a coincidental association between the paraprotein (e.g., MGUS) and the polyneuropathy would be more likely in a patient over the age of 50 with a chronic, distal, axonal, symmetric polyneuropathy who lacks prominent ataxia and any systemic or autonomic accompaniments. Dr. Burns serves as Podcast Editor for Neurology®; performs EMG studies in his neuromuscular practice (30% effort); and has received research support from the Myasthenia Gravis Foundation of America and Knopp Neurosciences Inc. Dr. Mauermann performs EMG studies in her practice (30% effort) and receives research support from Pfizer Inc. and NIH/NINDS.
. Peripheral neuropathy. Lancet 2004;363:2151–2161.
. Intensive evaluation of referred unclassified neuropathies yields improved diagnosis. Ann Neurol 1981;10:222–226.
. The evaluation of chronic axonal polyneuropathies. Semin Neurol 2007;28:133–151.
. 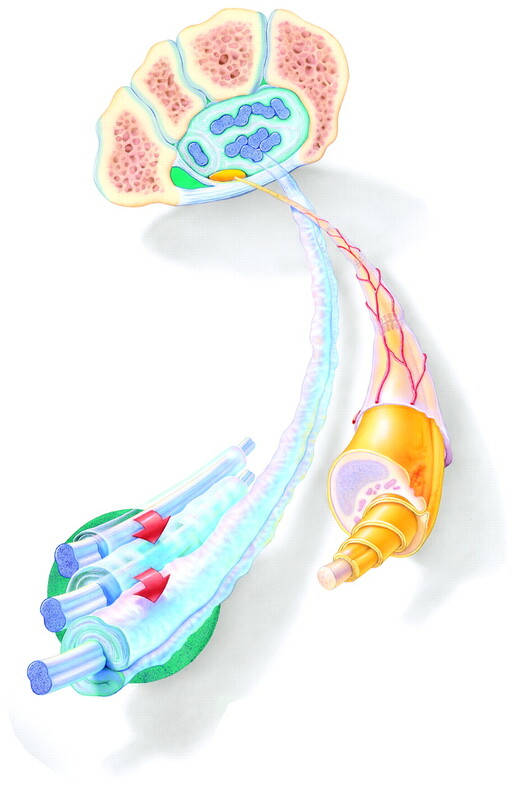 Approach to peripheral neuropathy and neuronopathy. Semin Neurol 1998;18:7–18.
. Clinical evaluation and investigation of neuropathy. J Neurol Neurosurg Psychiatry 2003;74(suppl II):ii3–ii8.
. Peripheral neuropathy. BMJ 2002;324:466–469.
. Toward an efficient method to evaluate peripheral neuropathies. J Clin Neuromuscul Dis 2002;3:172–182.
. Alcoholic neuropathy is clinicopathologically distinct from thiamine-deficiency neuropathy. Ann Neurol 2003;54:19–29.
. Toxic and deficiency neuropathies. Continuum Lifelong Learning Neurol 2003;9:160–181.
. Additional causes for distal sensory polyneuropathy in diabetic patients. J Neurol Neurosurg Psychiatry 2006;77:354–358.
. Small-fiber neuropathy. Muscle Nerve 2002;26:173–188.
. Practice parameter: evaluation of distal symmetric polyneuropathy: role of laboratory and genetic testing (an evidence-based review): report of the American Academy of Neurology, American Association of Neuromuscular and Electrodiagnostic Medicine, and American Academy of Physical Medicine and Rehabilitation. Neurology 2009;72:185–192.
. Practice parameter: evaluation of distal symmetric polyneuropathy: role of autonomic testing, nerve biopsy, and skin biopsy (an evidence-based review): report of the American Academy of Neurology, American Association of Neuromuscular and Electrodiagnostic Medicine, and American Academy of Physical Medicine and Rehabilitation. Neurology 2009;72:177–184.
. Diabetic neuropathies: classification, clinical features, and pathophysiological basis. Neurologist 2005;11:63–79.
. Microvasculitis and ischemia in diabetic lumbosacral radiculoplexus neuropathy. Neurology 1999;53:2113–2121.
. Idiopathic neuropathy, prediabetes and the metabolic syndrome. J Neurol Sci 2006;242:9–14.
. Challenges in the identification of cobalamin-deficiency polyneuropathy. 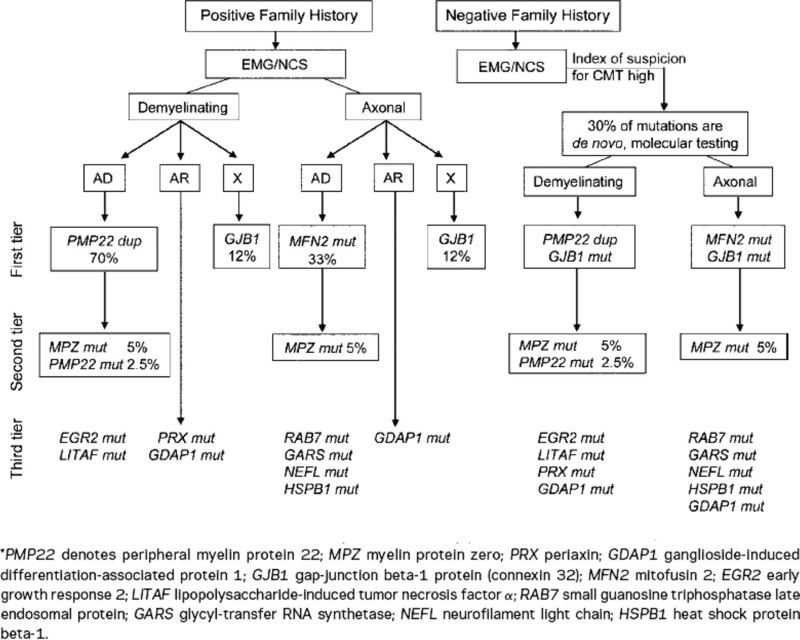 Arch Neurol 2003;60:1296–301.
. Neuropathies associated with paraproteinemia. N Engl J Med 1998;338:1601–1607.
. Chronic acquired demyelinating polyneuropathies. Semin Neurol 2008;28:168–184.